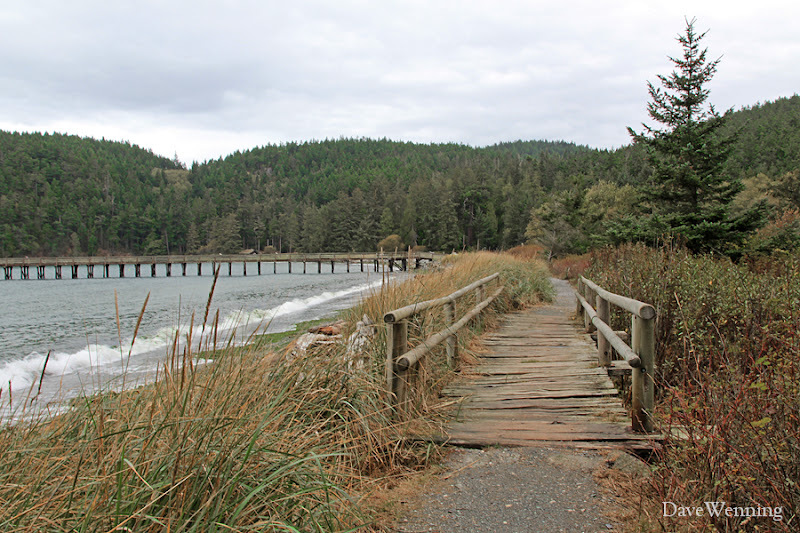 Autumn has arrived on South Fidalgo Island with cooler temperatures and a welcome bit of rain. Between showers, it's a great time for a walk in the woods. 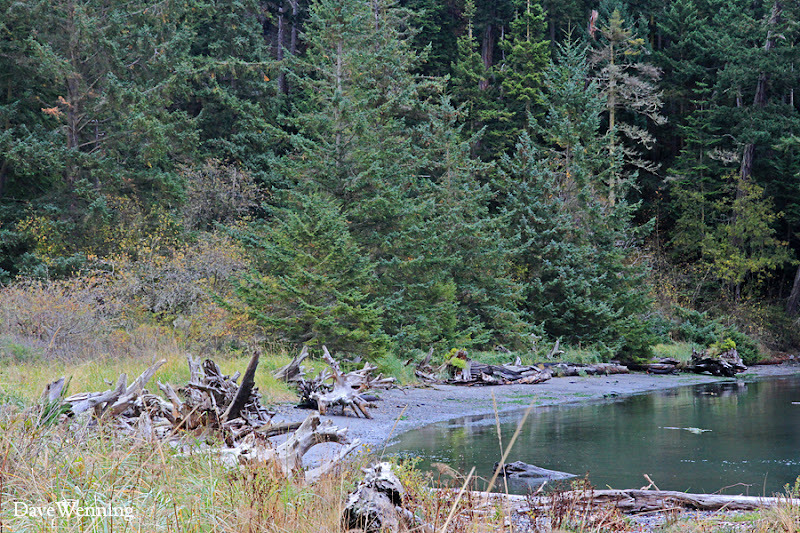 Nearby Deception Pass State Park is one of the best places to see both the forest and the trees. Hang your Discover Pass on your rear-view mirror and join me on a hike in the woods. Overcast skies paint the landscape in shades of gray now. Blustery winds will kick up some surf along the beach at Bowman Bay. Our destination will be Lighthouse Point on Deception Pass. It sits on the outer edge of Reservation Head on the right in the photo. This is actually a small island that is connected to Fidalgo by a tombolo or sand bar. The trail to Lighthouse Point begins just past the fishing dock. 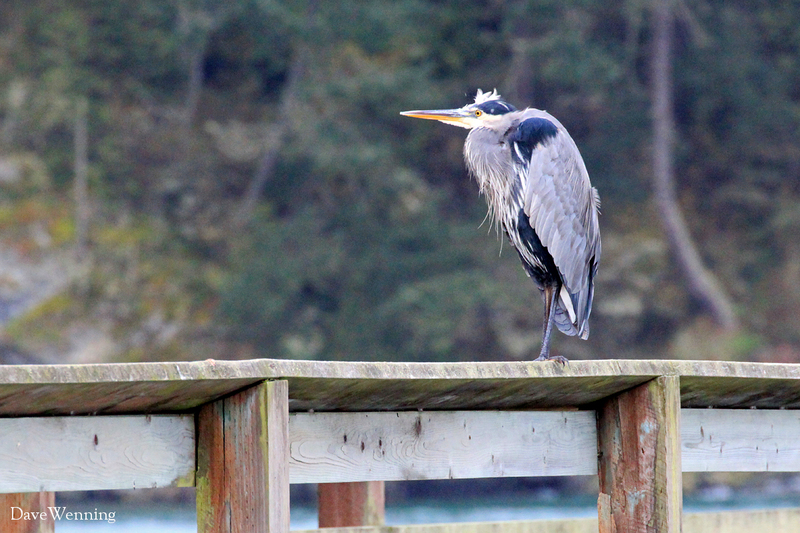 A Great Blue Heron finds the railing of the dock a convenient place to rest after some early morning fishing. 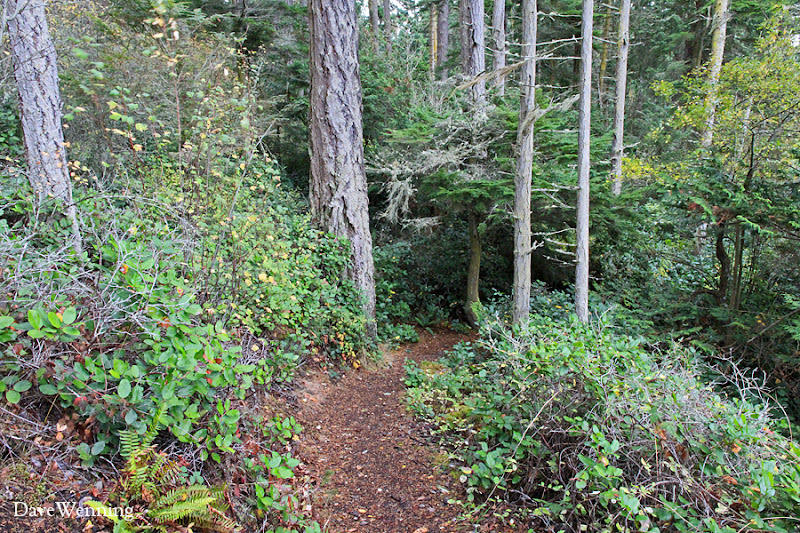 The trail begins with a brief climb, skirts the cliff over Bowman Bay, then descends back down to the beach. 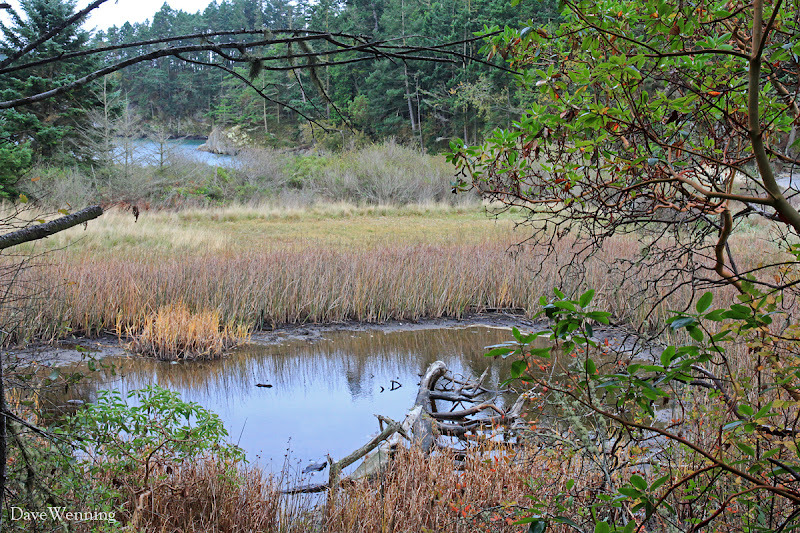 A small wetland and salt marsh on the tombolo are visible from the trail. The beach along Bowman Bay becomes part of the trail to Lighthouse Point. We will cross over the tombolo to Lotte Bay, then veer right back into the forest on Reservation Head. Another brief climb puts us on a trail that skirts the bluff along Lotte Bay. 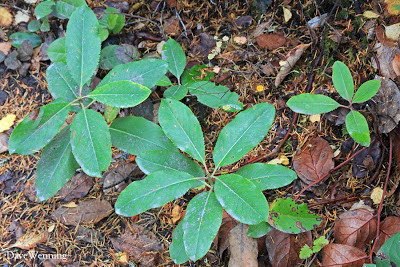 Pacific Madronas find low rainfall and a sunny, southern exposure to their liking. Because the park sits at the edge of the Olympic Rain Shadow, drought tolerance is a requirement for the vegetation here. The Madronas are shedding their thin, reddish bark to expose new green tissue underneath. This is just one of the unusual characteristics of this very special tree. These Madronas look like dance partners, undulating in unison to changes in terrain and light over time. 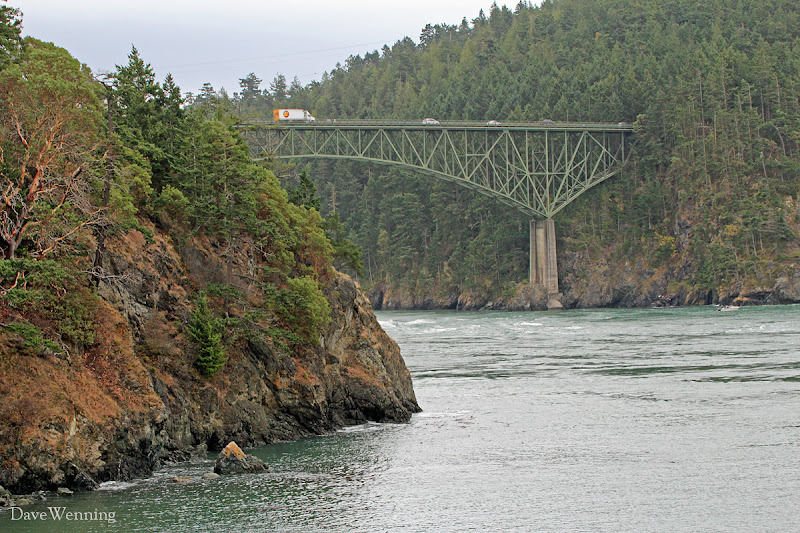 Arriving at a stone outcrop over Lotte Bay, we get the first glimpse of the Deception Pass Bridge. Traffic will disappear into the forest where it exits the bridge as if entering a tunnel. Whitecaps and rapids under the bridge reveal the swift tidal currents that can flow through the narrow gorge. Small boats must sometimes wait for calmer conditions before venturing through. 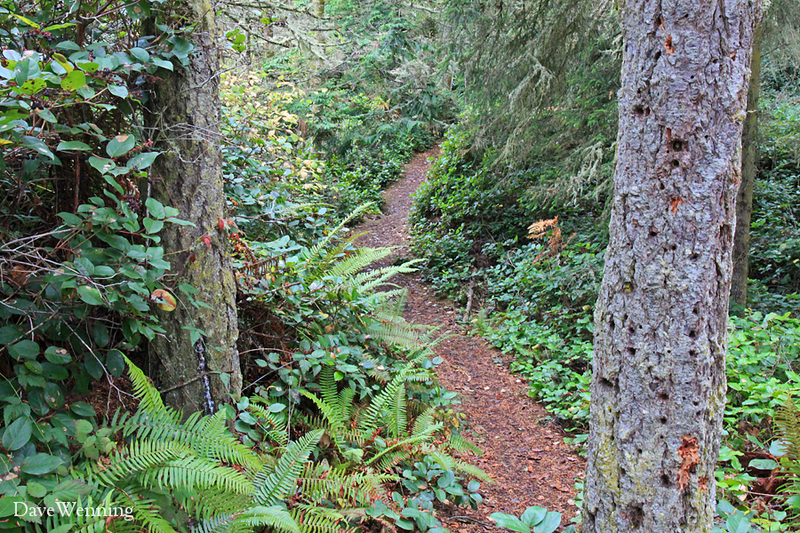 The trail now heads away from the bluff and deeper into the woods. 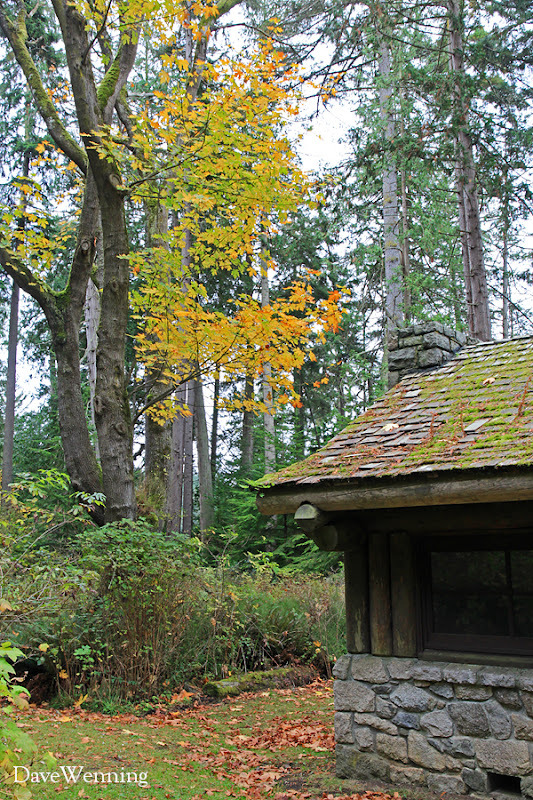 The dominant trees are Douglas Fir, Grand Fir and Western Redcedar. If "seeing the forest" is your goal, however, notice that there is a lot more growing here then trees. You are in the midst of "Tracker's Pharmacopoeia." If you've read Kidnapping the Lorax, you'll know what I mean. 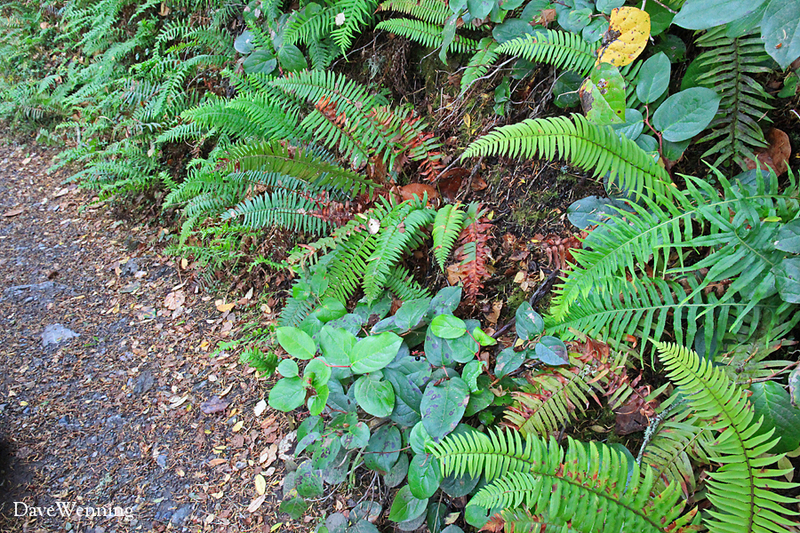 You will also know how to use those Sword Ferns in the foreground to treat nettle stings. This is like the forest in which Lacy Thurman learned to survive. 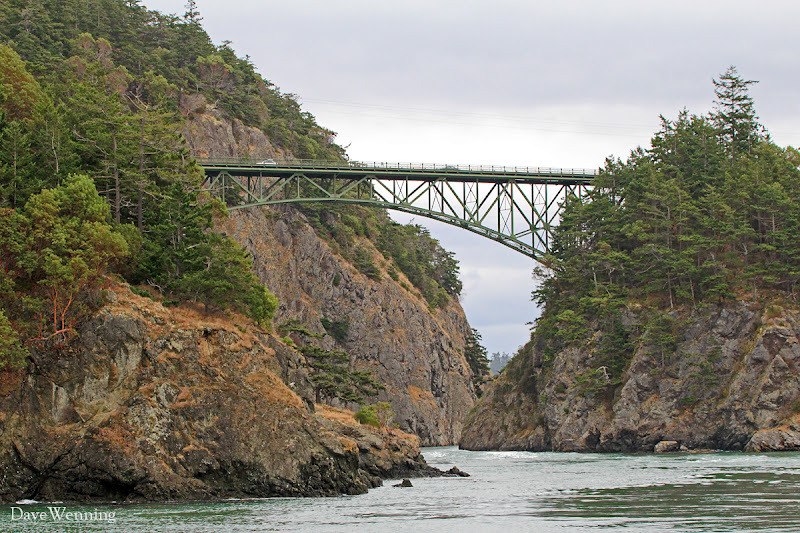 Arriving at Lighthouse Point, we find some of the best views of the Deception Pass Bridge. There are actually two bridges situated at an angle. 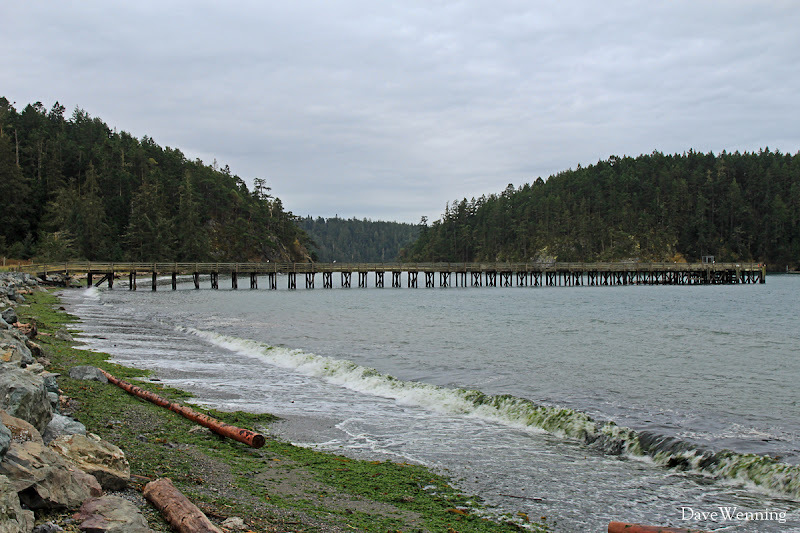 The shorter span on the Fidalgo Island side crosses Canoe Pass. 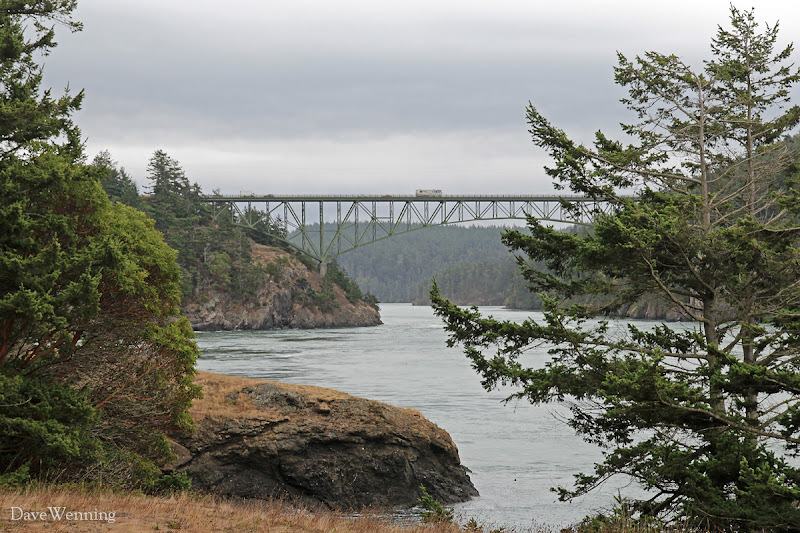 The longer span crosses Deception Pass to Whidbey Island. Between the spans is Pass Island which is basically a big rock sitting in the waterway. Notice that the rugged landforms on the north side of the pass are built of solid, volcanic stone. 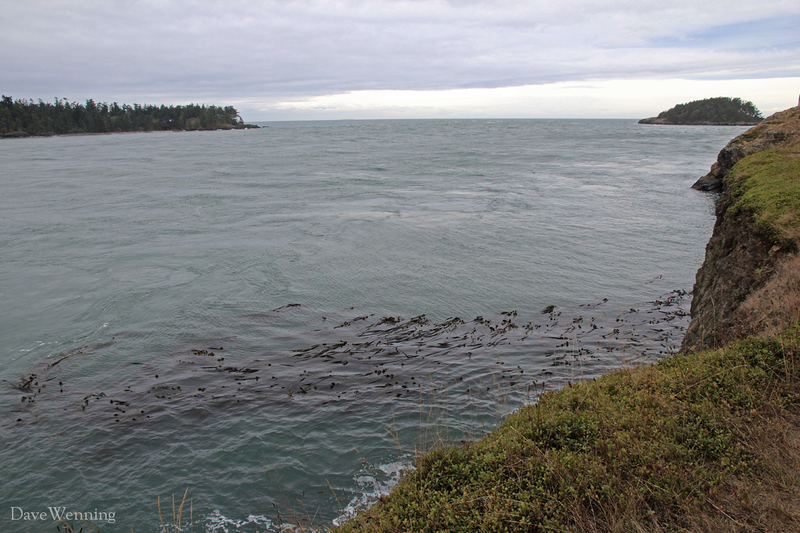 To the west, Deception Pass joins the Strait of Juan de Fuca. The northwest tip of Whidbey on the left and Deception Island on the right are the "Pillars of Hercules," so to speak. These mark the entrance to the pass. The rocky headlands here are carpeted with Kinnikinnick. Below the cliffs, forests of Bull Kelp sway in the swift currents. Nearby, you will spot the small, mechanized navigation light that guides boats through Deception Pass. 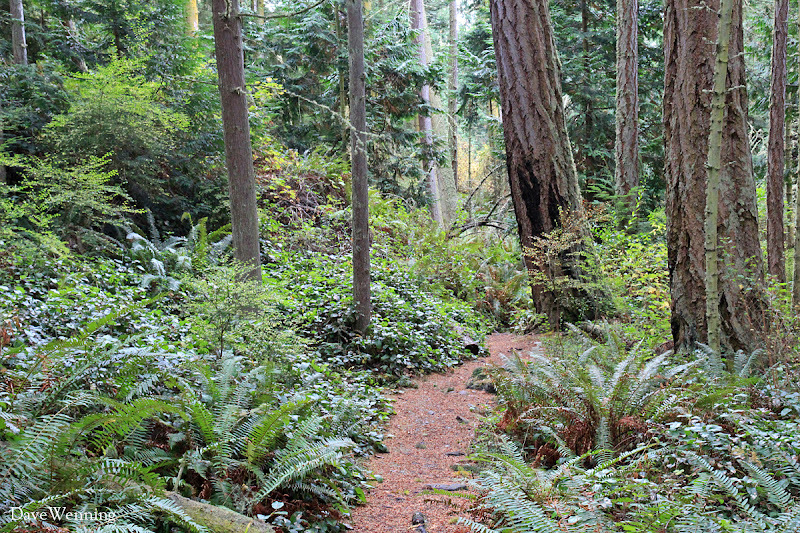 From the meadows of Lighthouse Point, the trail continues in a loop back through the forest. A few deciduous trees and shrubs in the understory provide some autumn gold highlights in a forest of green. Watch your step along the trail. After a rain, the native Banana Slugs will be out and about. I noticed all the slugs on the Fidalgo side of the park have no spots, just like the ones in my yard. The slugs on the Whidbey side of the park all had the camo look with black patches. 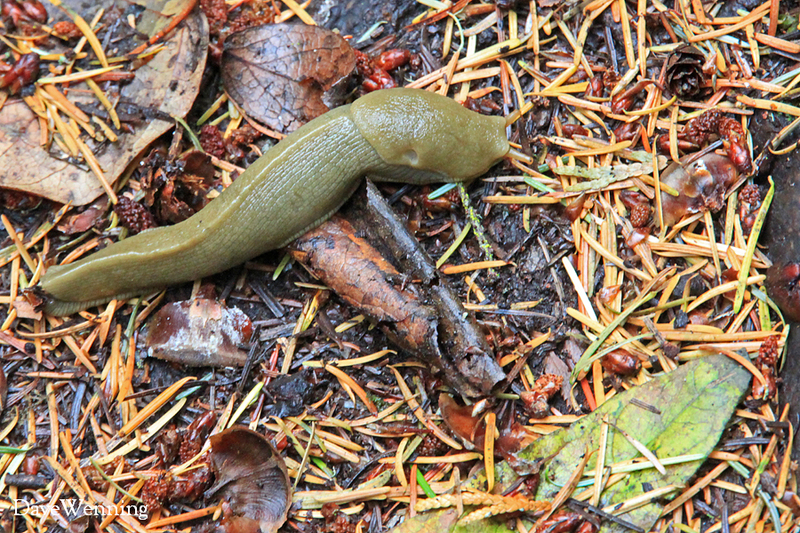 I wondered if spotless Banana Slugs are a special South Fidalgo Island variety. Remember, these are not garden pests. They are an essential part of the forest ecosystem and they deserve your protection. 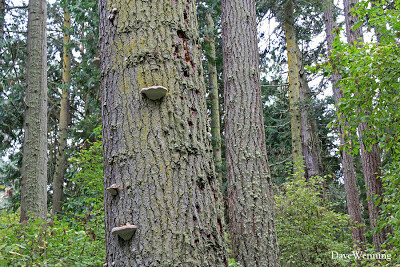 Lichens and fungi of all sorts decorate the trees. The gold stains on the trees are dust lichens. 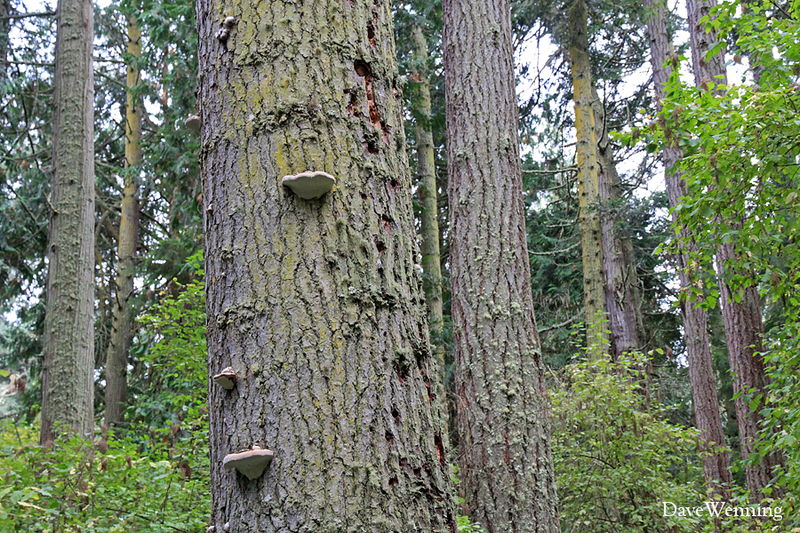 Shelf fungi serve as obituary for what looks like a mature Grand Fir. 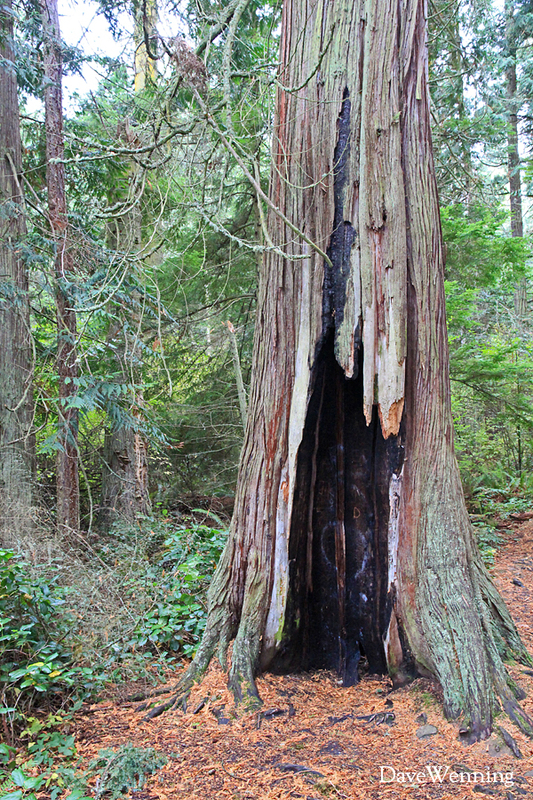 It seems a shame, but eventually, it will fall to the ground and become a nurse log for new generations. Can you see the evidence that there are woodpeckers in this forest? 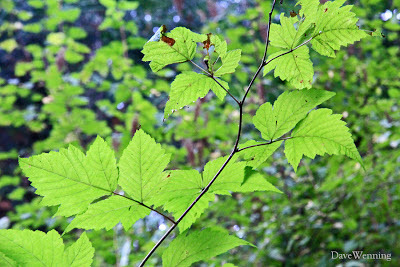 I liked the way these leaves were catching a bit of light in the understory. They literally glowed in the deep shade. Click or right-click on the photos to enlarge them. 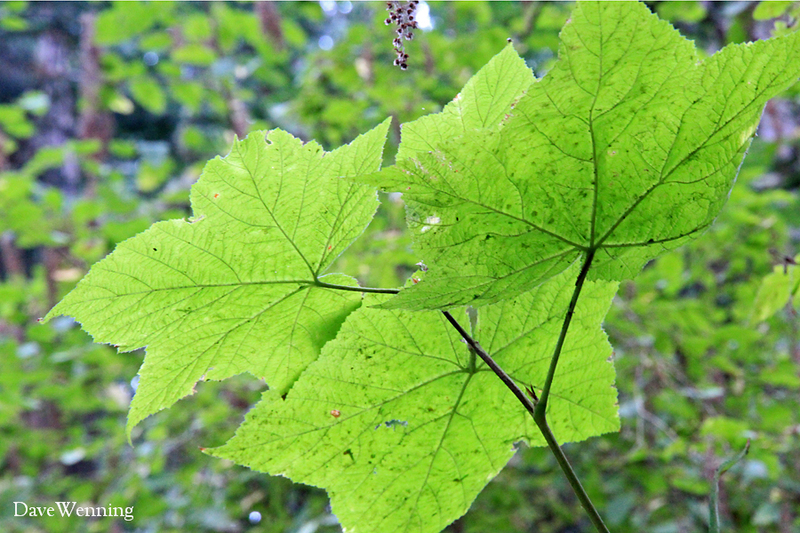 The big leaves on the left are Thimbleberry and on the right, Salmonberry. I did not need to stoop to get these photos. These shrubs had grown way over my head reaching for precious sunlight. Salal and and low-growing Longleaf Oregon Grape line the trail and carpet the floor of this forest. Along with Western Sword Ferns, these are the foundation plantings in this garden. Mosses become the lawn and lichens add a bit of sculpture. 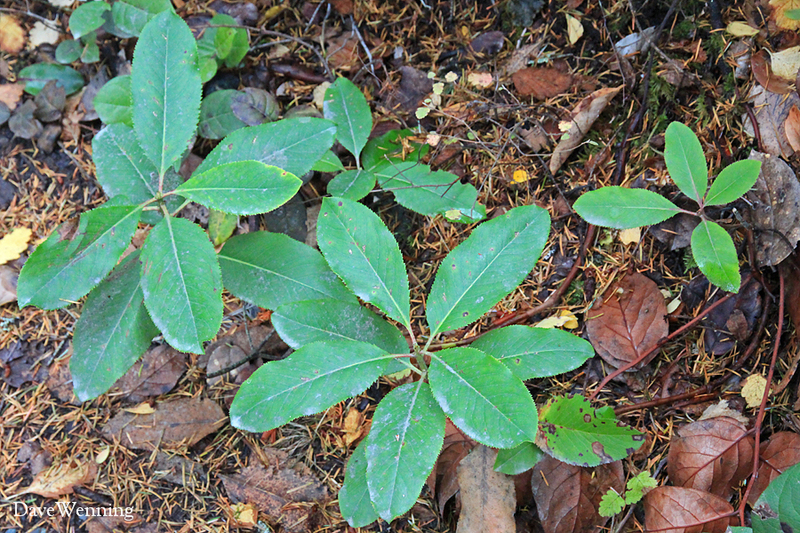 The family resemblance of baby Madronas (left) to Rhododendrons cannot be mistaken at this stage. 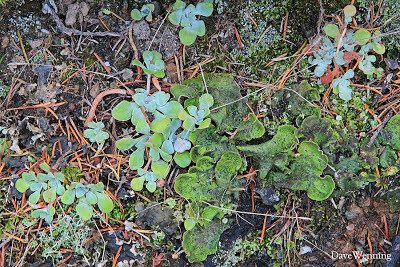 On the right, lichens, mosses and succulents grow on the faces of stone walls along the trail. They completely cover the stone like fancy, decorative wallpaper. In the Pacific Northwest, this is our version of Eden. If you look up, you cannot see the sky for most of the way along the trail. The canopy is completely closed and the opportunity for photosynthesis is limited. 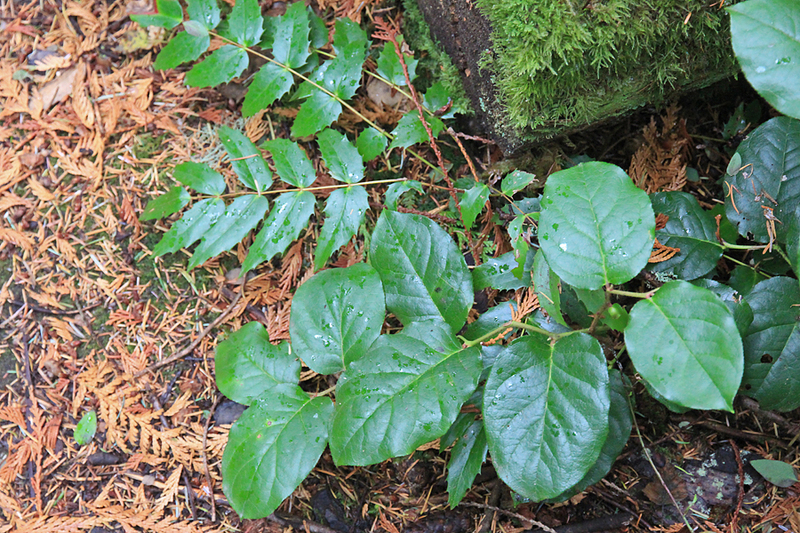 In these shady conditions, plants use other strategies for survival. 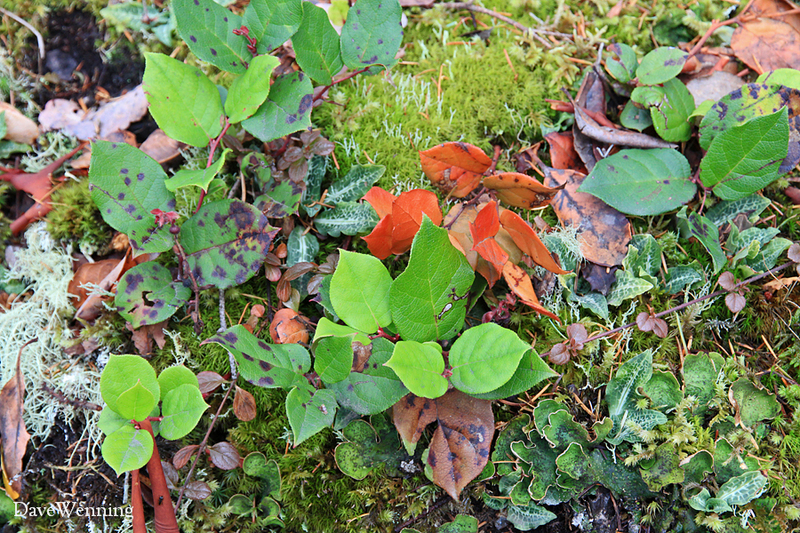 Can you spot the orchids growing with the Salal among the lichens and mosses? 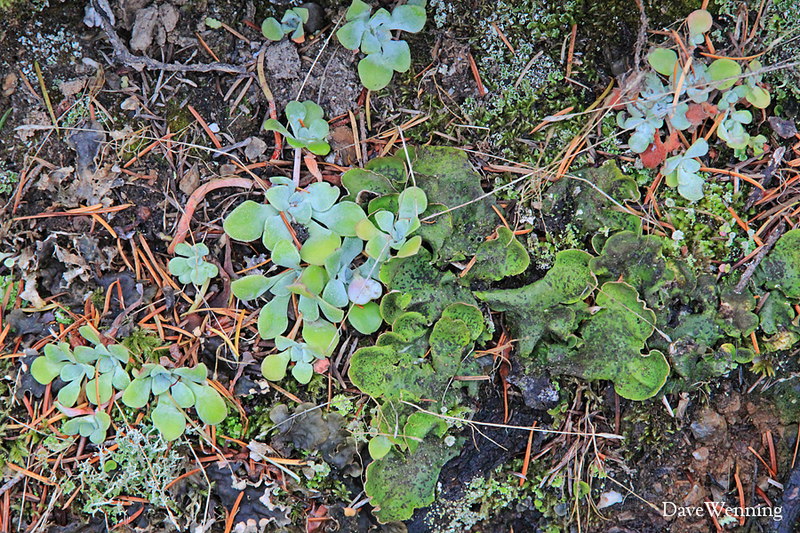 Both Salal and Rattlesnake Plantain orchids have cast off a need for sunlight and fertile soil. They rely on a symbiotic relationship with fungus around their roots for their nutrition. 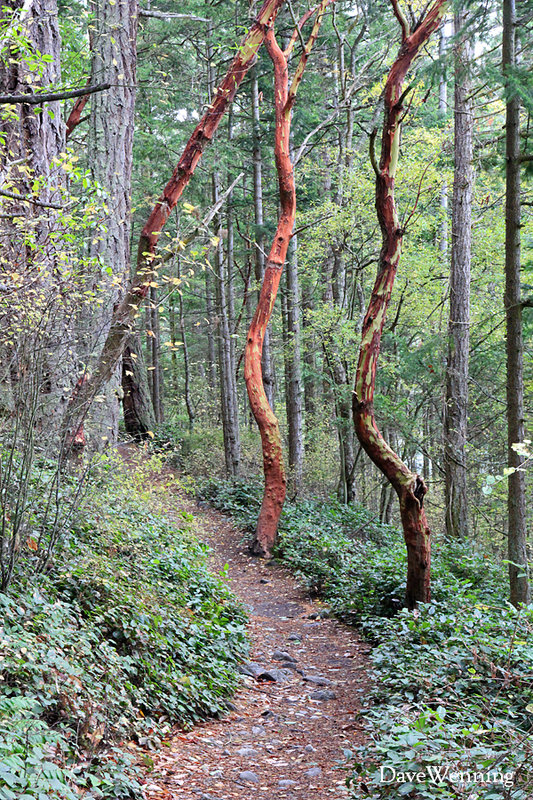 Many Northwest plants and trees like the Pacific Madrona have adopted this strategy. This is the look I am trying to create in the shade under the big firs in the back corner of my yard. 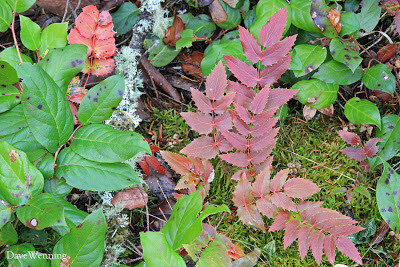 The soil is poor and tends to be dry, exactly what these native plants seem to like. Even the ferns, once established, are surprisingly drought-tolerant. These primitive plants are specialists in growing under conditions of scarce resources. When it rains, some of the water will never reach the ground. It will be trapped in the branches of the conifers and evaporate back into the air. Can you see why local forests have become an inspiration for my garden? This old-growth Western Redcedar has survived time, fire and the vandalism of tourists. Another dust lichen imparts a gray-green color to the bark. This is a massive tree, about 8 feet (2.4 m) in diameter at the base. I could not see the top through the canopy. It serves as a landmark. It sits where the trail divides to form a loop around Lighthouse Point. I like to take the left route to approach the point and return clockwise along the right side of the tree. When you visit, stop here to pay your respects to the old gentleman and treat him kindly. Arriving back at the tombolo, notice the driftwood that has collected at the head of Lotte Bay. 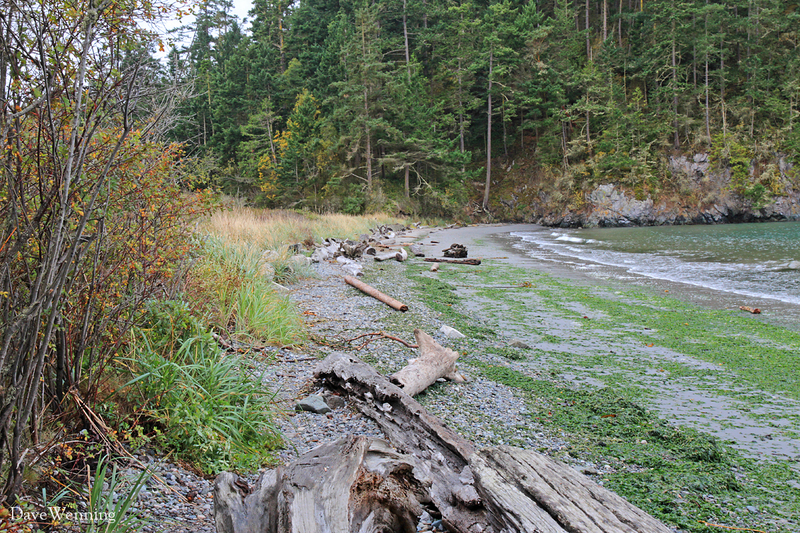 Even driftwood, dead trees washed up on the beach, are an essential part of the ecosystem (pdf). It provides food and habitat for wildlife, serves as substrate for plants, delivers organic nutrients and stabilizes beach erosion. Life after death is the lesson of nature and of the forest. A rustic wooden bridge marks the end of the trail back at Bowman Bay. It crosses a stream that drains the wetland near the edge of the bay. Watch your step. The bridge can be slippery when it's wet. While you cross, pause to reflect on both the forest and the trees you have just visited. It would be a nice treat to see your camera settings per photo. We wales those trails his past summer. Should also be a great fall exploration. Thank you for sharing these wonderful photos of my home state… So everyone else on the world could see how beautiful we have it. Thanks for the tour; it's nice to see what it looks like in autumn. It's warming up here again...mid 80's! You know how I always love this hike. Thanks for taking me back there yet again. Hey, really awesome post, sounds wonderful!!! From your pictures of your garden on your blog, I bet they would look spectacular! thanks for share!! !